Keeping pills fresh, secure, and organized – it’s what we do best. 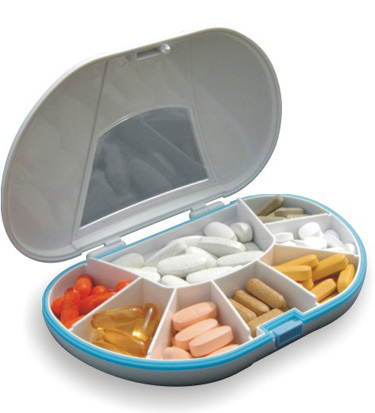 This vitamin organizer is the direct result of consumer demand. The Gasketed VitaCarry pillbox has a full gasket which makes it airtight and watertight and therefore effective against moisture and oxidation concerns. The pill dispenser can be locked securely, but the spring-loaded mechanism assures simple release. This large pillbox has 8 roomy compartments and an be used as your weekly pill box – the first 7 can be used for each day of the week and the 8th is an extra large compartment for those extra large supplements or medications. Although the Gasketed VitaCarry pillbox is large enough to hold up to 150 tablets, it is still small enough to fit into your purse or pocket.